The San Carlos city manager on Wednesday said the entire ordeal involving a mysterious pile of debris that left some neighbors complaining of dust and stench was a miscommunication. 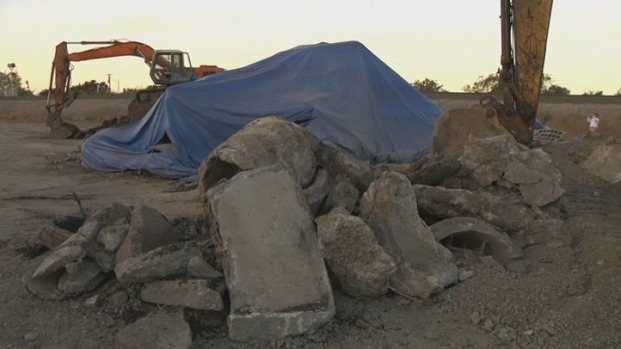 Jeff Maltbie told NBC Bay Area that a KJ Woods Construction executive told the job foreman to store some dirt in a particular place, but the foreman ending up dumping materials at the wrong site. Over the weekend, neighbors complained of dust rising from the debris and smelling. They worried what toxins might be inside the pile. Maltbie said the debris was a combination of pipe reinforcement with rebar and trench dirt. Some San Carlos residents are complaining of health problems after dust from an illegal dump site sent a cloud over a neighborhood. Terry McSweeney reports. The city became aware of the blunder on Saturday afternoon, Maltbie said, and crews covered it up with tarp so the winds wouldn’t blow more dust. Maltbie said that the city will not fine KJ Woods, but they will send the company a bill. The company has been doing sewer maintenance work in the city.